Berkshire Mountain Bakery • An artisanal bakery since 1985. Offering a wide selection of Artisanal Breads, Pizza, delicious Homemade Soups, Spreads and fine Baked Goods. sweet william's • hand-made cookies and specialty desserts. we make a variety of delicious baked goods, all from scratch, using the finest ingredients we can find.... and we do really great coffee too. Main Street Catering • There should be no limit to your vision and imagination. Especially when it comes to your special day. we tailor our services to what you want...when and where you want it. Marketplace Kitchen • Catering is at our the heart and soul. Along with our elegantly delicious food, we provide you with an experience – stimulating all your senses, the way food is meant to be celebrated. Lion Rock Farm • A wide array of year-round event sites, in buildings and barns, outside in the gardens, in the fields or under a tent. The venue also offers two guest houses to accommodate eighteen guests. Party Resources LLC • Dixie Todd is a renowned event planner who has been creating unique parties for more than twenty-five years. Santarella • Santarella, affectionately known as the Tyringham Gingerbread House, is a truly unique and beautiful setting, a magical place where you can make your dreams come true. The Chef’s Shop • Since 1991 The Chef’s Shop offers the region’s finest selection of quality cookware and tabletop accessories at the guaranteed lowest prices anywhere. HGS Home Chef • We offer all the cookware, tools and gadgets that any home chef could possibly desire but what sets us apart is our two beautiful teaching kitchens. New Preston Kitchen Goods • With great cookbooks and all-star brands, you're armed and ready from stovetop to table If you can't find it here, you probably don't need it in your kitchen. The Amazing Real Live Food Company • Artisanal Cheeses and Probiotic Products: Chaseholm Camembert, Queso Blancos, Fresh Herbed Farmers Cheeses and Ice Cream alternatives. 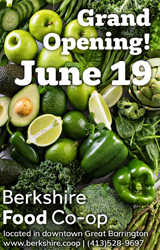 Berkshire Co-op Market • Cooperative natural food store selling organic, local products, dedicated to community development, public health, environmental stewardship and sustainable agriculture. Bimi's Cheese Shop • We offer a carefully-curated selection of cheeses and provisions both from our county and region, as well as from the wide world beyond our bucolic little town. Bizalions Fine Food	• “Marseilles-infused charcuterie-café [where] everything is as good as it gets...” - NY Times. Step into France to enjoy a prepared meal or an imported one. Coach Farm • Artisanal, Farmstead goat milk yogurt and cheeses from the Hudson Valley. Please stop by and place your individually wrapped order. Creamery at Twin Maple Farm • Proud to support the community by producing unparalleled cheeses, promoting world-class agriculture and sourcing 100% of our milk from local, family run dairy farms. Farm Country Soup • Artisan made soup, quiche, pies and tarts, seasonally inspired, locally sourced. Home of our roots in the Berkshires. Freund's Farm Market • The place to go in Litchfield County for seasonal farm goods and year-round baked treats! We offer farm-fresh produce, flowers and home baked desserts, pies and meals. Guido's Fresh Marketplace • THE source if you are looking for best-quality, wholesome and delicious food. A family-owned independent grocery store, the freshest, finest and friendliest since 1979. 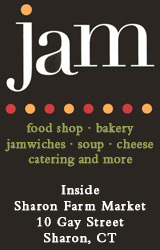 Jam Food Shop • Gourmet Deli and Bakery, Handmade Prepared Foods, Catering located in the Sharon Farm Market. Nodines • Nodine's Gourmet Store offers a superb selection of smoked meats, fish and cheese, homemade items including sandwiches and soups made with their products. "Enjoy the Old World Gourmet Flavor". Oliva • Gourmet Olive Oils and Vinegars! Enjoy sampling some of the finest, freshest extra virgin olive oils and aged balsamic vinegars available anywhere. Rubiner's Cheesemongers & Grocers • The feel of an old general grocery store in the center of this small New England town. Good sandwiches, cheese, of course, and other exquisite foods. Sharon Farm Market • A varied selection of food and produce, several different businesses under one umbrella; fresh fruit and vegetables, sushi, bakery and Jam's deli with deliciously prepared food. Slammin' Salmon • We offer that "old school" gourmet shop feel. Specialties include hand-cut aged steaks, artisan cheese, the freshest fish, local dairy products and free range organic eggs. Berkshire Mountain Distillers • With a line of award-winning artisanal spirits: Greylock & Ethereal Gins, Ragged Mountain Rum, Ice Glen Vodka, Berkshire Bourbon, New England Corn Whiskey. Tasting room. Domaney’s Liquors & Fine Wines • Beer. Wine. Liquor. A welcoming store with a democratic selection that takes the stress out of wine buying. Our customer service is paramount. Little Gates Wine Merchants • Buying wine need not be intimidating or complicated. Nor should it necessarily be expensive. We have a thoughtful selection in just about every price range. Nejaime's Lenox Wine Cellar • The Berkshires' premier merchants of wine, spirits and cheeses since 1970, featuring an award winning selection of wine and specialty foods. Also located in Stockbridge. Nejaime's Stockbridge Wine Cellar • The Berkshires' premier merchants of wine, spirits and cheeses since 1970, featuring an award winning selection of wine and specialty foods. Also located in Lenox. Salisbury Wines • Dedicated to offering a well-rounded selection of wines, spirits, and beer for all tastes and budgets, providing a warm, inviting atmosphere and helpful service. Spirited Wines • We take great pride in our extensive selection of wines and travel around the world to bring you great values, rare gems and the finest quality to satisfy your palate.